I, sweet Heather Beather, am notorious for "washing" the floors for Scottie Mom with my tongue. You just never know where you might find a scrap of something yummy. Despite my handy work, Scottie Mom always brings out a steam mop to clean the floors one more time. I promise you, Scottie Mom: I got this - there's no need to clean up after me! The minute she finishes washing the floors, Mr. K likes to bring out his toys and run around on the freshly steamed floors so everyone can see his paw prints and so he can begin painting the floors with doggie slobber once more! 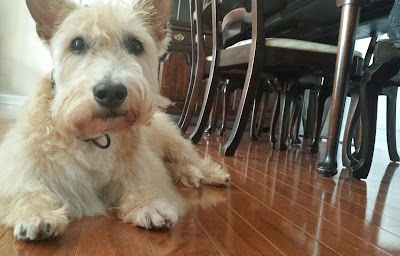 One of the most common questions I'm asked by Scottie Mom friends and fans - right after how I get my pups to pose for the camera so well and what "Mr. K" actually stands for - is how the Scottie House hardwood floors always seem so clean and shiny with two dogs running about the house. Until recently, there was no real secret to keeping it clean. Just some good, old-fashioned elbow grease and a bucket of hot water mixed with a bit of vinegar. The process of cleaning the hardwoods in the Scottie House by hand takes approximately four hours. Needless to say, we have a lot of hardwood flooring in the house - only the bedrooms have carpet. Washing the floors used to be an extremely laborious process but after going through two separate health scares that inspired this blog, I simply wasn't willing to risk another health scare by using any cleaning product with which Heather and Mr. K might come into contact. Read about Mr. K's brush with death here. To this day, we still don't have a diagnosis. Read about Heather's health scare, which occurred three months after Mr. K's, here. 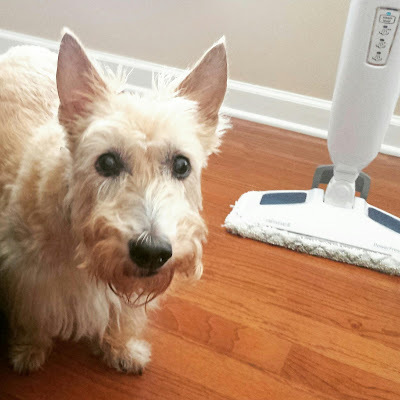 A few months ago, Scottie Dad came home with a Bissell Powerfresh Steam Mop. Truth be told, I wasn't too happy about it at first. I had heard steam mops shorten the life of the hardwood flooring over time and I was still skeptical about using anything other than water, vinegar and a few old rags to spruce up the place. Still, Scottie Dad insisted we give the steam mop a try because it only used water - no harsh chemicals. Reluctantly, I gave in and I'm so glad I did. The time it took me to clean the hardwood floors was reduced by 90 percent and the floors felt just as clean beneath my feet. This was huge. Having accepted a job that takes me about an hour and half away from home, I had less time to do household chores and spend time with my precious pups. To find something that was pet-friendly and gave me back more than 3.5 hours of my time was priceless. I'm pretty sure Heather and Mr. K approve, too, as this little steam mop doesn't make loud noises like that big, bad vacuum cleaner does. Most of the time, Heather and Mr. K will rest in their Scottie beds and observe the steam mop hard at work - even when it is just inches away from their beds. 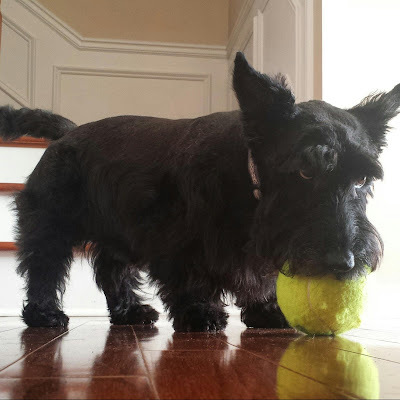 Now, we want to hear from you: what pet- and family-friendly cleaning tips and tricks do you have to share for keeping the Scottie House so fresh and clean? Comment below! We don't have wood floors, it's tile (some made to look like wood) and it's a different climate. We use a steamer after vacuuming that uses only water that has gone through the reverse osmosis system-the same water all of us drink. I reread the story about how K got his name and I hope you fired the groomer who thought he was female. A groomer, really? We just use water to clean with a bit of 'natural' disinfectant....of course, us dogs have never found a floor that's too dirty to eat off!.... Glad you've got a worry-free way to clean floors. It eases me to read all of this...my two are CONSTANTLY licking my Laminant floor and I walk on the fresh STICKY left behind. No matter how clean i think it is....they keep at it. I have often only used water and elbow grease, due to my boy's "Sensitivity" to almost EVERYTHING!!! it's nice to know it's a shared"neurotic" among these SCOTS!!!! They do the carpet occasionally too!!! We are still down with the hand scrub method. Tile, hard wood and carpet here. When anyone comes in they take their shoes off and my feet get wiped. Ummm... My peeps are pretty slack, they don't clean the floor very often. When they do they use water and white vinegar.